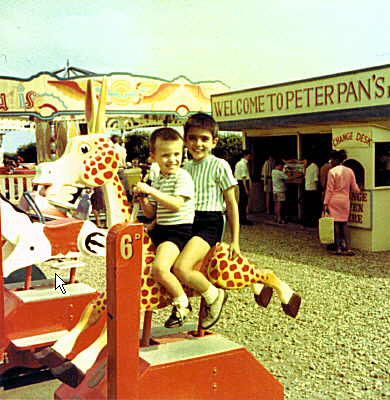 This photograph shows my two sons enjoying a ride at Peter Pan’s Playground in 1968. Besides conveying the modest feel of the place at that time, it’s interesting to see that a ride cost 2½p then. Not that that was particularly cheap: it probably equates to what you would pay today for such a basic ride. Nevertheless, it’s a reminder of how much our currency has devalued over the years. All of that is of little relevance, however: it’s always worth it to see kids having fun: priceless, in fact. This photograph brought back memories that go back to the 50s. Even then it was sixpence a ride so there was not a lot of increase the cost.